I needed another load of Yen so I decided to go to the bestforeignexchange.com currency shop which is located on Victoria Street. 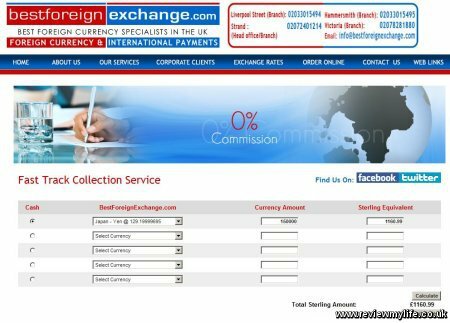 I found it listed as one of the best foreign exchange places on the Martin Lewis travelmoneymax.com website. Looking more closely at the bestforeignexchange.com website it turns out that this is another Thomas Exchange Global like the one I visited and reviewed on The Strand the last time I needed Yen. I’m guessing they are using different names and websites for each branch to get more coverage on the search engines and travel money comparison sites. That doesn’t matter to me though – I just want a good rate. To get the best rates they recommend you order your money in advance with their fast track service. I did this on the same day via their website. You just enter how much of each currency you want and then submit the order. You can specify that you will pay in cash so that you don’t have to pay any money until you get to the branch. The branch is at 141 Victoria Street, a short walk from Victoria station. As Victoria Street is a busy area I’d recommend you bring your cash in a hidden money belt. 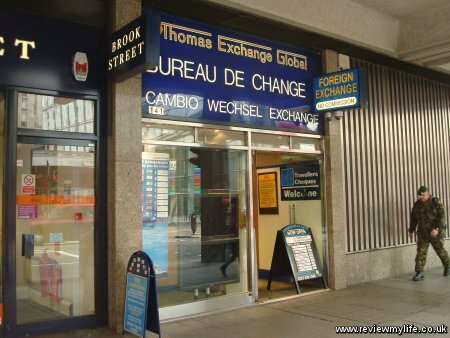 The main branding on the outside lists the shop is Thomas Exchange Global. When I arrived I told the man behind the counter that I wanted to collect an order – and gave my name which was the order reference. As my order was worth less than £2000 they didn’t ask for any ID. He retrieved the Yen very quickly and then put my pile of £20 notes through a bank note counting machine. He then counted out my Yen by hand twice, and gave it to me with my receipt, and a small amount of British change. In my case I didn’t request any particular bank note denominations so I can’t say what they are like for special requests – but there is a box on the order form for messages, so if you do have requests you could try putting them in the form. From arriving at the Victoria Thomas Exchange Global branch to receiving my Yen must have taken less than three minutes. They are very quick and seem to keep any verbal communication to the bare minimum. Both this and the Strand Branch of Thomas Exchange Global are very similar. They are very fast, and consistently appear near the top of the travelmoneymax.com list for Yen, so I’d happily use either of them again for cash orders. I’ll have another currency exchange review coming up soon. I split my Yen order into two batches so that 1) I wouldn’t be carrying/exchanging too much money at once and 2) so that I could try out two different travel money branches. This entry was posted on Monday, April 18th, 2011 at 8:09 am and is filed under Money. You can follow any responses to this entry through the RSS 2.0 feed. You can leave a response, or trackback from your own site. I Have 13,500 euros that I would like to exchange to English pounds, what can you offer? Hi Shirley – I can’t offer you anything! I hope it is fairly obvious that this website isn’t affiliated with the Thomas Exchange Global on Victoria Street. I’m just reviewing my experience of exchanging some money with them. You’ll have to visit them in person (or the bestforeignexchange website) for details of their costs.